It's Pub Night: I Won a Major Award! Even though I try to decorate every post on It's Pub Night with a picture of some kind, I have to admit that my photography skills are probably not what keeps this enterprise afloat. Now I have received official recognition of my deficiency -- I was dubbed the Grand Loser of the Yuletide Photo Contest on Alan McLeod's A Good Beer Blog. 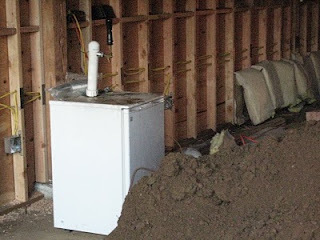 It was the picture above -- of a kegerator sitting next to the dug-up floor of the future Migration Brewing pub -- that pushed Alan over the edge and made him create a new prize category for the worst photo submitted. He claims it's the ugliest picture ever to appear on A Good Beer Blog. Gee whiz, it's probably one of the 20 best photos on It's Pub Night -- at least it wasn't taken with the 1.4 kilopixel camera on my old cell phone. Well, different bloggers have different standards. Speaking of which, you may recall that in past years two other Portland beer bloggers have actually won the real Grand Prize in Alan's contest, Dave Selden (Champagne of Blogs) in 2006, and Matt Wiater (portlandbeer.org) last year. Matt is a photographer by trade: take a look at his collection of Portland beer photography on his Flickr page. Not only are the pictures stunning, but they are a great document of the local beer scene. Not only did you win, but you entry was so monumental that it forged its own category. Not bad, not bad at all. A moment in beer blogging history to be sure. A major award! A major award! We own the universe! Oregon, Oregon, Oregon! I contributed, and while I didn't win any awards, Alan did post eight photos of mine on his blog--despite only allowing five. Goes to show that ignorance has its rewards.